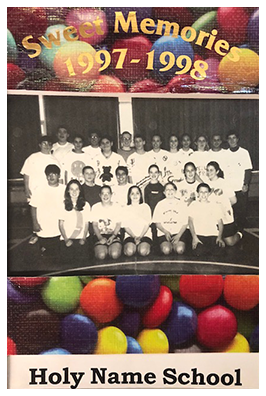 Please take a moment to read what our alumni have to say about Holy Name School. "My name is Mary, and I come from a family of five. I live with my mom, dad, sister Dorothy, and brother Anthony. All three of us attended Holy Name School, and we all attended Bishop Stang High School. I am finishing sophomore year and will be a junior in the fall at Bishop Stang. I am a part of campus ministry, pro-life club, student council, and I play softball. I am in college preparatory A classes and in the fall will be taking honors art as well. I work very hard for my grades therefore receiving first honors for the end of my sophomore year. In my junior year I will be taking seven classes, giving me a full schedule. I will also be doubling up my history class. In my freshman year I was awarded five academic awards and two sports awards at the end of the year. My favorite parts of Holy Name School were in kindergarten and fourth grade. In kindergarten I had Mrs. Carr as a teacher, and my favorite memory was having my prayer partner, Caroline Quinn. I was able to make shirts with her and also do many activities. I looked up to her. I also loved to sing about the alphabet people. In fourth grade my teacher was Mrs. Oliveria. My favorite thing in that class was when we took care of crayfish and learned all about them. We were able to feed, touch, and hold them. It was absolutely my favorite memory because it was the start to my future with animals." We are proud of our Holy Name School graduates as they continue their educational journey. My father, brother and sister all attended the Holy Name School. My favorite memory at Holy Name was our 7th grade field trip to Newport, RI. I had a blast being able to hang out with all my classmates and enjoy a beautiful day down in Newport. 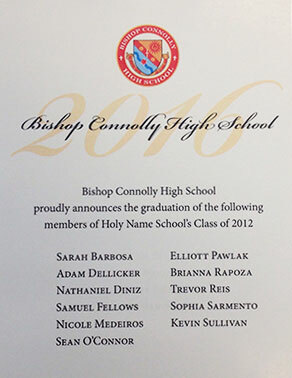 Congratulations to the eleven members of Bishop Connolly High School's graduating class of 2016 who were graduates of Holy Name School's class of 2012! We wish you well in your future endeavors. One of Our Own Returns! Mrs. Samantha Barreira, a life-long resident of Fall River, joins the 2016-2017 staff of Holy Name School as a teaching assistant for kindergarten and grade 2 students. Born Samantha Babcock, she entered Holy Name School as a first grader and graduated from eighth grade in 2002. She went on to complete her high school years at B.M.C. Durfee, and then attended Bristol Community College, graduating in 2009. She married Daniel Barreira two years later, and they are now the parents of Riley, entering first grade, with one year already behind him at Holy Name; and his younger sibling Mackenzie, another potential Holy Name student. Samantha brings her interests in arts and crafts to Holy Name, as well as her special interest in sign language. The Herald News has selected Emma Santoro, a 2005 Holy Name graduate, as one of their “Best and the Brightest.” This is an excerpt from a feature story in the May 20, 2016 edition. A top student, active community volunteer, and superstar swimmer at B.M.C. Durfee High School, Emma Santoro easily landed among the Best and Brightest for 2009. She broke every swimming record at Durfee during her time there, and she continued her reign in the swimming pool lanes at Colgate University. She was captain of the swimming team in 2012-13, was on the all-team Patriot League for four years, and ended as league 400IM champion in 2013. Though she originally set her sights on the Olympics when she was at Durfee, Santoro said she decided to “hang up her suit” and end on a high note with her collegiate swimming career. Santoro lives in Boston and works with an agency that specializes in tech industry staffing for tech startups and Fortune 500 firms. She is also a part-time sales rep for Jolyn, a California-based swimwear company. These days, she is more likely to be found in a yoga studio or out running than in a swimming pool. She has run in four half marathons and plans to begin yoga teacher training this fall. “I love living in Boston,” she said. At Colgate, Santoro majored in English with an art minor. As with any recent college graduate who didn’t chose a specific career path such as nursing or teaching, Santoro said her greatest obstacle has been figuring out what her adult self is most passionate about and transitioning that passion into a career. “I think my plans are still evolving,” she said. “The journey isn’t about where you end up, but who you become along the way,” she said. There’s something to be said for having flexibility and allowing life’s experiences to guide you along. 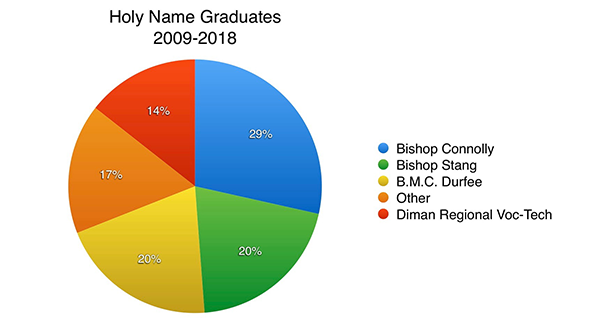 Bishop Stang’s class of 2020 has recently elected as their new president Gabriellla Joaquim, a member and president of Holy Name School’s class of 2016. Congratulations, Gabbie!